Eukaryotic flagella. 1-axoneme, 2-cell membrane, 3-IFT (intraflagellar transport), 4-basal body, 5-cross section of flagella, 6-triplets of microtubules of basal body. A simplified model of intraflagellar transport. Numerous eukaryotic cells carry whip-like appendages (cilia or eukaryotic flagella) whose inner core consists of a cytoskeletal structure called the axoneme. The axoneme serves as the "skeleton" of these organelles, both giving support to the structure and, in some cases, causing it to bend. Though distinctions of function and/or length may be made between cilia and flagella, the internal structure of the axoneme is common to both. Inside cilia and flagella is a microtubule-based cytoskeleton called the axoneme. The axoneme of primary cilia typically has a ring of nine outer microtubule doublets (called a 9+0 axoneme), and the axoneme of a motile cilium has two central microtubules in addition to the nine outer doublets (called a 9+2 axoneme). The axonemal cytoskeleton acts as a scaffolding for various protein complexes and provides binding sites for molecular motor proteins such as kinesin II, that help carry proteins up and down the microtubules. The axoneme structure in non-motile ("primary") cilia shows some variation from the canonical “9x2 + 2” anatomy. 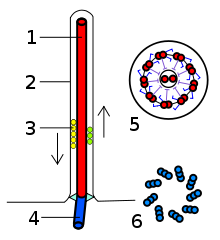 No dynein arms are found on the outer doublet microtubules, and there is no pair of central microtubule singlets. This organization of axoneme is referred as “9x2 + 0”. In addition, “9x2 + 1” axonemes, with only a single central microtubule, have been found to exist. Primary cilia appear to serve sensory functions. 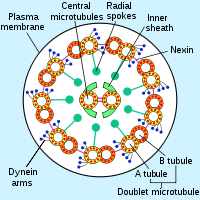 The building-block of the axoneme is the microtubule; each axoneme is composed of several microtubules aligned in parallel. To be specific, the microtubules are arranged in a characteristic pattern known as the “9x2 + 2," as shown in the image at right. Nine sets of "doublet" microtubules (a specialized structure consisting of two linked microtubules) form a ring around a "central pair" of single microtubules. Besides the microtubules, the axoneme contains many proteins and protein complexes necessary for its function. The dynein arms, for example, are motor complexes that produce the force needed for bending. Each dynein arm is anchored to a doublet microtubule; by "walking" along an adjacent microtubule, the dynein motors can cause the microtubules to slide against each other. When this is carried out in a synchronized fashion, with the microtubules on one side of the axoneme being pulled 'down' and those on the other side pulled 'up,' the axoneme as a whole can bend back and forth. This process is responsible for ciliary/flagellar beating, as in the well-known example of the human sperm. The radial spoke is another protein complex of the axoneme. Thought to be important in regulating the motion of the axoneme, this "T"-shape complex projects from each set of outer doublets toward the central microtubules. The inter-doublet connections between adjacent microtubule pairs are termed nexin linkages. Mutations or defects in primary cilia have been found to play a role in human diseases. These ciliopathies include polycystic kidney disease (PKD), retinitis pigmentosa, Bardet-Biedl syndrome, and other developmental defects. ^ Porter, M.; Sale, W. (2000). "The 9 + 2 axoneme anchors multiple inner arm dyneins and a network of kinases and phosphatases that control motility". The Journal of Cell Biology. 151 (5): F37–F42. doi:10.1083/jcb.151.5.F37. PMC 2174360. PMID 11086017. ^ Gardiner, Mary Beth (September 2005). "The Importance of Being Cilia" (PDF). HHMI Bulletin. 18 (2). Retrieved 2010-03-18. Wilson, C.W. ; et al. (2009). "Fused has evolved divergent roles in vertebrate Hedgehog signalling and motile ciliogenesis" (PDF). Nature. 459 (7243): 98–102. doi:10.1038/nature07883. PMC 3204898. PMID 19305393. Vogel, G. (2005). "Betting on cilia". Science. 310 (5746): 216–8. doi:10.1126/science.310.5746.216. PMID 16223997. Porter, M.E. & Sale, W.S. (2000). "The 9 + 2 Axoneme Anchors Multiple Inner Arm Dyneins and a Network of Kinases and Phosphatases that Control Motility". The Journal of Cell Biology. 151 (5): F37–42. doi:10.1083/jcb.151.5.F37. PMC 2174360. PMID 11086017. Dillon, R.H. & Fauci, L.J. (2000). "An Integrative Model of Internal Axoneme Mechanics and External Fluid Dynamics in Ciliary Beating". Journal of Theoretical Biology. 207 (3): 415–30. CiteSeerX 10.1.1.127.4124. doi:10.1006/jtbi.2000.2182. PMID 11082310. Omoto, C.K. ; Gibbons, I.R. ; Kamiya, R.; Shingyoji, C.; Takahashi, K. & Witman, G.B. (1999). "Rotation of the Central Pair Microtubules in Eukaryotic Flagella". Molecular Biology of the Cell. 10 (1): 1–4. doi:10.1091/mbc.10.1.1. PMC 25148. PMID 9880321. Rosenbaum, J.L. ; Cole, D.G. & Diener D.R. (1999). "Intraflagellar transport: the eyes have it". Journal of Cell Biology. 144 (3): 385–8. doi:10.1083/jcb.144.3.385. PMC 2132910. PMID 9971734. This page was last edited on 5 April 2019, at 01:38 (UTC).